The flashlight fish uses bioluminescent light to detect and feed on its planktonic prey, according to a study published February 8, 2017 in the open-access journal PLOS ONE by Jens Hellinger from Ruhr-University, Bochum, Germany, and colleagues. The splitfin flashlight fish, Anomalops katoptron, is one of many ocean-dwelling animals that produces its own bioluminescent light using symbiotic bacteria. The fish has light organs located under its eyes such that the light can be turned on and off by blinking, like a flashlight. Little is known about the function and purpose of the Morse code-like blinking patterns displayed by the fish. 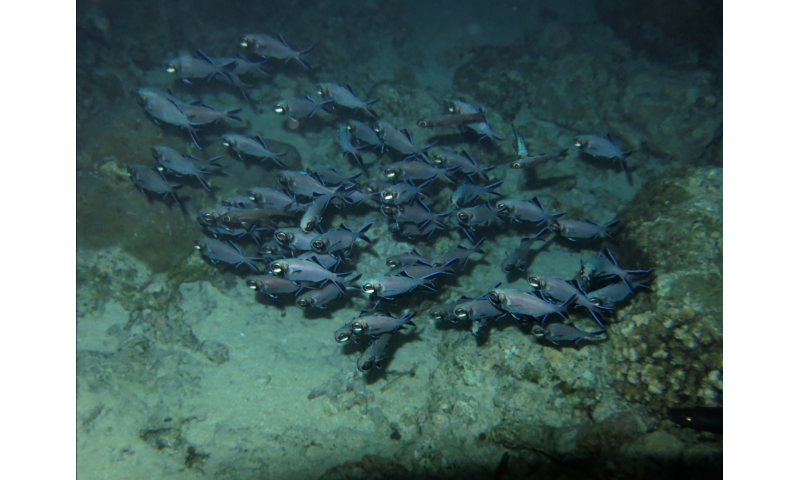 To investigate how the flashlight fish uses bioluminescent illumination, Hellinger and colleagues examined the blink frequency of a school of flashlight fish under different laboratory conditions. They found that during darkness at night time, the flashlight fish blink very frequently, at 90 blinks per minute, with the light being on and off for an approximately equal amount of time. However, when the flashlight fish detected living planktonic prey in the experimental tank at night, their light organs were opened for more time, keeping the light on longer, and they blinked five times less frequently than in the absence of prey. The authors suggest that the flashlight fish reduce their blinking and keep their light organs open so that they can produce more light to detect and feed on prey. They recommend additional field research to see whether the fish display the same behavior under natural conditions. "The splitfin flashlight fish Anomalops katoptron use bioluminescent light to detect planktonic prey during the night and adjust the blink frequency in a context dependent manner," says Hellinger. "The loss of luminescence and subsequent light organ degeneration demonstrates the close symbiotic relation between the fish and its luminescent bacterial symbionts."